When faced with an entire house of items to pack up, tending to your family’s clothing may not seem like a big deal — until you begin. If you don’t pack those clothes properly, you could end up with a messy mix of wrinkled, torn or even stained garments when you arrive at your new home. 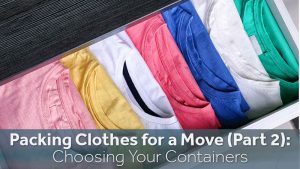 While packing up clothing isn’t difficult, it does require a little know-how. Plastic Wrap or a Garment Bag. High-end dresses, suits or other garments do need a little TLC when moved. If you have a sufficient number of garment bags (used for traveling), then zip them in there and hang in a wardrobe box (more on those in a minute). If you don’t have enough garment bags to hold all of your good clothes, you can buy a roll of plastic wrap from your local dry cleaning supply store (it’s the same wrap the dry cleaner uses), or you can even use large size garbage bags to cover the garment. Be sure to tie the bottom of the bags to keep the garment safe inside. Wardrobe Boxes. Wardrobe boxes are the absolute best way to move clothing still hung on hangers. It helps keep wrinkling at bay and are easy to both pack and unpack. The problem is, these nifty storage boxes can be quite pricey, so most people reserve them for hanging only their best garments. Regular boxes. Clothes aren’t very heavy, so you can usually pack quite a few pieces into a standard packing box. Stack t-shirts, jeans, sweaters, etc. in boxes, seal and write on the top what’s inside for easy retrieval later. Suitcases. 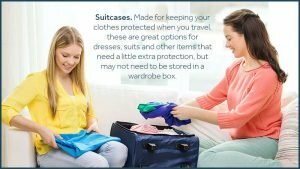 Made for keeping your clothes protected when you travel, these are great options for dresses, suits and other items that need a little extra protection, but may not need to be stored in a wardrobe box. Vacuum bags. A wonderful option for larger, bulkier pieces like jackets and coats, vacuum bags allow you to pack more by shrinking the items into a smaller space. Dressers and Bureaus. Why pack socks, underwear, and sleepwear if you don’t have to? In most cases, they can be left right in the drawers of your dresser. Just be sure to secure the drawers with straps or bungee cords so they don’t fly open (spilling your garments) during the transition. Whether you need help moving your items from one home to another, or you need somewhere to store off-season clothes due to limited space, Zippy Shell Greater Columbus offers a variety of options. Our containers can make your next move easy by allowing you to pack your belongings at your own pace; then, let us transport your belongings to your new home, or store what you don’t need right away until you are ready for them. To find out how Zippy Shell can ease the chaos of your next move, call today for a free consultation. What to do when movers are late? How to prepare for moving into a college dorm?